Home » Penn athletes lead semistate pack! Penn High School is one of two schools in the state of Indiana with four teams competing in Indiana High School Athletic Association semistate events this weekend (Oct. 23-25), as well as being represented in the IHSAA tennis individual state finals. Pictured in front, from the left, Trent Gidman (boys soccer), Jensen Stroinski (girls soccer), Danielle Frank (girls cross country), Julia Nafe (girls cross country), and Matt Evans (boys cross country). Pictured in back, from the left, Penn High School principal Steve Hope, Thomas Gifford (boys tennis), Tim Porsche (boys tennis), Penn High School athletic director Aaron Leniski. Penn’s boys and girls soccer teams each won regional championships last weekend, and the boys and girls cross country teams also qualified for berths at the semistate level. Doubles players Thomas Gifford and Tim Porsche will wear Kingsmen colors in the IHSAA individual tennis state finals this weekend. Center Grove also has four teams in semistate action this weekend, and has a tennis state finalist. Penn’s girls golf team was also a state finalist earlier this season, placing 11th. The Penn volleyball team begins sectional play at home on Saturday, Oct. 24 and Penn’s football team on Friday, October 23, also at home. “The Penn community is proud to be represented by dedicated student-athletes who have our athletic teams competing at the highest levels in the state,” Penn High School Principal Steve Hope said. “The outstanding work of the coaches, and the tremendous support of the parents, families and fans of Penn's student-athletes is greatly appreciated. 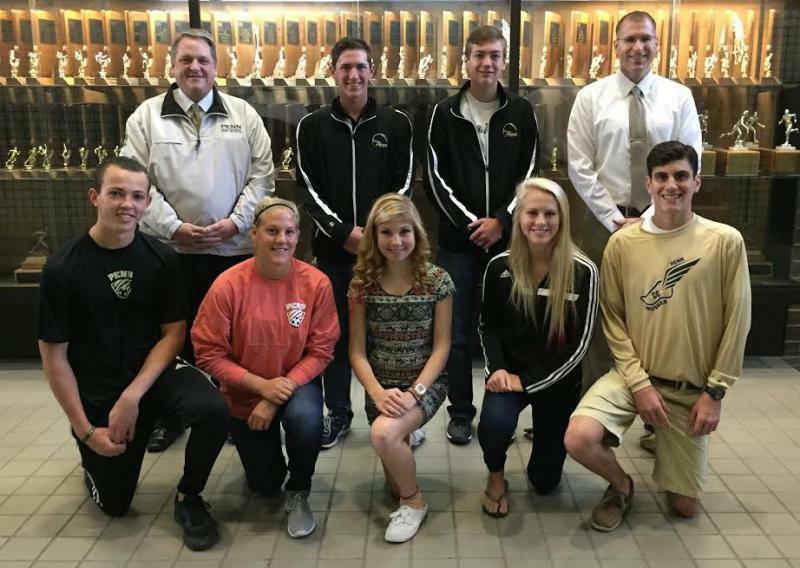 Penn athletic director Aaron Leniski expressed pride in the accomplishment by the Kingsmen Fall Sports teams. “I am very proud and excited for these teams,” Leniski said. “This is a major accomplishment for each of these programs and a reflection of the hard work, dedication, and commitment put in by these student-athletes and our coaching staff since the completion of the 2014 season. State finals action is scheduled for 2 p.m. on Friday, Oct. 23, and 10 a.m. and 2 p.m. on Saturday, Oct. 24. GIRLS SOCCER: Penn plays Leo in the South Bend St. Joseph Semistate at noon on Saturday, Oct, 24. If the Kingsmen win, they play the Fishers-Munster winner at 7 p.m. Saturday night for a berth to the state championship game at 3:30 p.m. on Saturday, Oct. 31, at Carroll Stadium in Indianapolis. Coach Jeff Hart’s Kingsmen are 19-0-2 and have racked up 15 shutouts. Penn has outscored its competition 21-0 in state-tournament play. Five Penn players have already committed to play college soccer. Sophomore Kristina Lynch has committed to defending national champion Florida State, sophomore goalie Mackenzie Wood has committed to Northwestern, senior Kamra Solomon has committed to Furman, senior Jensen Stroinski has committed to IPFW, and senior MacKenzie Mason has committed to Wittenberg. In addition senior Sydney Bright will play for Holy Cross College and senior Hannah Ehrhardt will play for St. Francis College. BOYS SOCCER: Penn takes on Fort Wayne Canterbury at 10 a.m. on Saturday, Oct. 24, in the Warsaw Semistate. If the Kingsmen win, they play the winner of the Lake Central-Harrison match at 7 p.m. on Saturday. At stake is a berth to the Class 2-A state championship game at 6 p.m. on Saturday, Oct. 31, at Carroll Stadium in Indianapolis. Penn claimed the South Bend Regional championship with a thrilling 2-1 sudden-death victory against Elkhart Memorial. It was the fifth regional championship in program history, and first since 2009. Semistate action at Fort Wayne’s Plexx athletic complex is set for 1 p.m on Saturday, Oct. 24.